As usual, I viewed the San Diego Comic-Con’s 2017 edition as an opportunity to get a barometer on the next year in high-profile genre films and television shows, along with pop culture in general. Besides attending the convention in person, I waded through Twitter, online panel recaps, and videos of the various panels to pull together what I found to be the highlights. Anyone betting that Marvel’s hot hand would be soon ending might want to wait another year. Despite having made a bigger splash at Disney’s D23 convention the prior weekend, Marvel did manage to light up fan discussion around a few key projects. There were no many earth-shattering moments at this panel but there was some incremental news of note. The latest trailer for the third “Thor” movie, “Thor: Ragnarok,” looked solid as it became more clear that it was a team-up movie involving Thor and the Hulk retaking control of Asgard. I saw instant analysis by more than one pundit who called the trailer the best blockbuster trailer of the year so far. Director Ryan Coogler again made a strong impression with a preview of new “Black Panther” material and a clear lover for the character. That project continued to simply have a certain confidence and passion to it that was rare with most super-hero films. Other mentions were made of bits of news from the “Ant-Man” sequel and news of Michelle Phiefer likely signing up as the original (but previously-missing) Wasp. Fans were also shown the material from the upcoming third “Avengers” film that people had seen at D23 last weekend. The Netflix darling of 2016, “Stranger Things,” teased a trailer for its second season that seemed to hit all the right notes for fans. The period references included the effective repurposing of the Vincent Price narration from “Thriller” and the fan favorite character Eleven was shown, as expected, to be very much in the mix again. With a Halloween premiere date, this increasingly seems like an obvious slam dunk. A trailer for the second season of “Westworld” did not have much material since filming was only a week in but what was shown was particularly impressive given that situation. The smiling face of Ed Harris at the end of the preview was seemingly just what fans wanted to see. Nothing of any real substance was revealed but the panel included all the key cast members, such as Evan Rachel Wood, Thandie Newton, and Ed Harris. Todd McFarlane’s “Spawn” had a not-well-regarded adaptation by New Line Cinema in 1997 and a somewhat-better-regarded HBO animated adaptation in the same era. After years of McFarlane promising a new film, word was finally announced that Blumhouse would be producing a new “Spawn.” The twist was that McFarlane himself would direct. Who knows how this film turns out but the circumstances seem to point toward at least some manner of a win. The business model that Blumhouse founder Jason Blum employs is such that the film will surely be low-budget, perhaps around $10 million and risks will be contained. At that risk level, the film makes a lot of sense. The adaptation of Stephen King’s “It” got a good reaction to trailer footage and news came that the same creative staff would be involved in a sequel that seemingly concludes the story started in the first film. For those unfamiliar with the book, it focuses on a group of kids fighting a clown-like demon in the 1950s (apparently updated to the 1980s in the new film) and then touches on the lives of those kids as adults thirty years later. The book was notable but imperfect and it remains to be seen if the film adaptation(s) can overcome the ending flaw that plagued that work (a flaw common with King’s books). The reunion panel for the Ron Moore-helmed “Battlestar Galactica” series from the mid-2000s did not feature Edward James Olmos in person (just on a video recording) but the candid comments from stars who did attend got a nice reaction. The death of Richard Hatch during the past year, an actor who appeared in both the ‘classic’ “Battlestar Galactica” series and on the later re-imagination, caused several on the panel to give tributes. Off-site attractions were more popular than ever, with the streets surrounding Petco Park often jammed up with people. A festival on the far side of the overpass bridge was full of food vendors while television shows and movies had plenty of off-site options that tried to one-up one another. Of note was the “Game of Thrones” exhibit again being available, as well as a “Blade Runner 2049” off-site with VR and movie props in a mockup of a futuristic bar. An even more elaborate off-site experience for “Westworld” had fans buzzing but the opportunity to take the tour was limited to appointment only and small groups. The only significant misstep that I heard about regarding off-site attractions was some panning of the “It” offsite event that involved it leading up to a one-note scare by Pennywise the Clown. The exaggerated-look licensed figures by Funko Pop and their competitors continued to be the Beanie Babies of the day and an end to their popularity did not yet seem in sight. I had heard some early speculation that fan interest in these figures might be declining but they had positively saturated Comic-Con for yet another year. Attendance was again strong at many smaller panels. One example was a Hollywood Location Manager/Scouting panel with a friend, we were both shocked by how the room filled with roughly three hundred people and became ‘sold out.’ Interest in even less-than-flashy functions related to entertainment creation remained high. The good news was that smaller panels were still easy to get into if you did not care about seat location and the ability to ‘float’ between non-high-profile panels was easy. Dinners with notable comic book artists seemed to be a growing success as limited numbers of fans had a chance to have dinner and get sketches or autographed ‘swag’ from Walter Simonson for $500 and J. Scott Campbell for between $700 to $1200. Those were steep prices but the swag items being included made it possible that someone could likely come close to breaking even on the meals if they chose to re-sell them on eBay. If you were going to Comic-Con in 2017 and focused only on Hollywood films, the Saturday lineup was probably the only stretch of Hall H that satisfied you. The rest of the days featured a pronounced tilt toward television shows that reflected a multi-year trend. With that in mind, it was odd to note that the L.A. Times ran a piece on the eve of Comic-Con that trumpeted the idea of Hall H being a ‘kingmaker’ for films but all their cited examples were presented between 2005-2010. 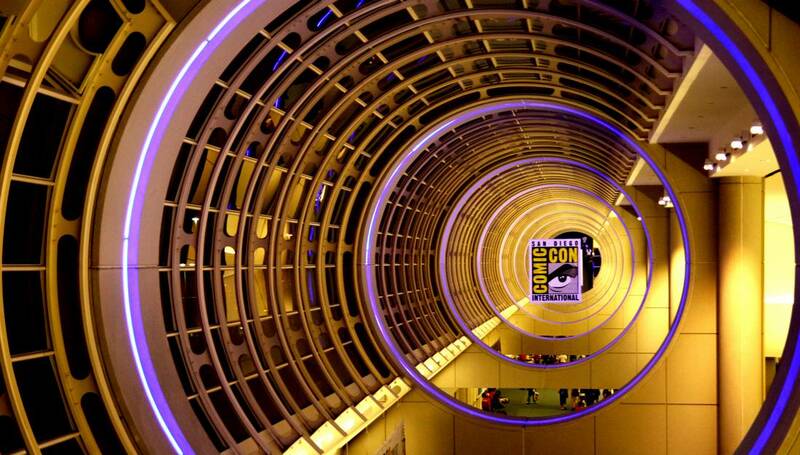 San Diego Comic-Con had film publicity opportunities snatched up weeks or months ago by other conventions such as the South by Southwest Convention, the Star Wars Celebration, Disney’s D23 convention, and the theatrical exhibitor convention, Cinema-Con. Again, Disney’s D23 last weekend took a big bite out of the content that fans might have otherwise been shown. While Marvel Studios did have a panel, “Star Wars” fans were largely left in the cold. The best that “Star Wars” fans could come up with was likely news related to book tie-ins to the “Last Jedi” and a Princess Leia-centric book. Head scratchers included a breakfast cookbook entitled “BB-Ate.” Sure, fans gleaned information from toy examples that was not previously known, like Kylo Ren likely having a particular Tie Fighter in “The Last Jedi,” but those kinds of details were not setting the world on fire. Repeat, D23, repeat? Disney stole Comic-Con’s thunder by holding their D23 convention a week prior to Comic-Con 2017. In a time before D23 existed, Disney would surely have shown footage from the upcoming sequel to “Mary Poppins” that ended up being a hit with fans at D23. That movie, along with other Disney films, was simply not present at Comic-Con. Outside of a special vinyl record booth on the exhibit floor having a good turnout, fans of Disney’s non-comic book properties had to have been kicking themselves if they missed D23. The “Secret Empire” summer event has been disastrous, with Marvel finally seeming to set pieces in motion such that – eventually – Captain America would no longer be a traitor and ‘bad guy.’ The ‘Marvel Legacy’ issue renumbering initiative seemed ill-advised and it was causing anger amongst confused retailers. Neil Gaiman’s return to conclude this continuation of the classic Alan Moore-started series “Miracleman” was clarified as still being a work in progress. It appeared that artist Mark Buckingham was still at work on the new material that had been originally solicited before disappearing. Annual losers due to the timing of the show’s airing of new episodes and the convention’s usual July timeslot. This year, the convention took place as season seven was just getting underway and the cast members who attended were tight-lipped. Fans saw a new season seven trailer, giving a peek at what was ahead in coming weeks but that was about it. Oddly, the convention hall and downtown San Diego were filled with “Game of Thrones” advertisements and it was confusing as to why HBO chose to spend so much money advertising a show that everyone was already watching. Legendary ruled Comic-Con as recently as a few short years ago, but it again did not have much of a presence this year. The little impact that it did make was to show a promotional video related to its upcoming “Pacific Rim” sequel. The days of Kevin Smith having an annual, evening panel in Hall H on Friday night were apparently over. Smith was at the convention, again performing a side gig as a host for IMDB interviews with guests and he moderated a trivia panel. Beyond those roles, he showed up in a few panels unannounced but made no lasting waves. Diamond Comic Distributors presented retailers with statistics showing a decline in spending year over year from 2016 to 2017 of around 6%. On a related note, IDW announced a more-focused lineup of titles by reducing output by 25%. This was pitched as a good thing and maybe it will be for them but there was also an ominous report prior to the convention about IDW having been losing money and seeking additional investment capital to function. Unlike other major comic book publishers, who survive by having revenue coming in from licensing their characters, IDW functions by paying money to many different intellectual properties to produce comic book based on those properties. That did not seem to be the best business model right now. The Will Smith-starring, David Ayers- directing “Bright” was apparently a $180 million movie that will debut on Netflix as a streaming film on December 22. It was initially reminiscent of “Alien Nation” (1988) but seemed to be a little more complicated than that film with, obviously, an exponentially larger budget. How that budget works for the Netflix business without full theatrical support remained to be seen. Also, the quality of the work itself remained to be seen, with Ayers seeming to be oddly pre-occupied with pushing a hard-R rating. The Japanese manga “Deathnote” has a strong following amongst Japanese import fans and the manga’s creator was involved in Netflix’s upcoming adaptation. The trailer played well and the film was presumably made at a financial level not anywhere near that of “Bright,” so the ingredients for relative success seemed to be in place. Fans saw the first episode of the Netflix Marvel team-up “The Defenders” and reaction was good. Some reviewers said that the Iron Fist material in that episode was the weakest material though. Given criticism of the recent first season of the solo series, perhaps it was no surprise that Netflix confirmed that it would be switching show runners for the newly-announced second season of “Iron Fist.” While the first season was seemingly a hit with audiences, the show was still as-yet the most-criticized Netflix Marvel production. This panel concluded with a bit of a peek at upcoming “Punisher” series and that also seemed to get good marks. The new “Inhumans” television show on ABC looked ‘okay’ in a trailer that advertised an early-September IMAX theatrical event for the first episode. One had to assume that the first episode would have a relatively big budget but how much the spectacle could be maintained on a weekly basis remained to be seen. The concept seemed an odd fit for television. Over on the Hulu streaming subscription platform was an adaptation of the lower-profile but interesting “Runaways.” The makings of a hit were present but Hulu was yet another subscription service chasing the same customers as the many other such services. The success of “Wonder Woman” has changed the negative narrative surrounding Warner Bros. and their DC cinematic universe but there always seem to be threatening storm clouds on the horizon. One still did not get the impression that Warner Bros had its act together regarding DC properties. Early news on Thursday appeared in an interview with Kevin Smith for IMDB when it was announced that “Shazam” would be directed by David F. Sandberg of the low-budget “Lights Out” and “Annabelle: Creation.” Given past association, most assumed that Dwayne ‘The Rock’ Johnson would appear in this film but news later came out that that was not the case. Rather, Johnson was still doing a separate “Black Adam” film. A rumor that Ben Affleck would be soon leaving the role of Batman was spread by the Hollywood Reporter but this claim was later denied by Affleck on the Justice League panel. Some upcoming film plans were made official, like the no-brainer “Wonder Woman 2” and “Green Lantern Corps.” On-the-bubble films like “Justice League Dark” seemed to still be in production. Also, the Flash film was revealed to be entitled “Flashpoint,” a surprise of sorts since that seemed to reference a storyline involving alternate realities. That material had been previously covered in a DC animated film while more-recently covered in a story arc of the CW’s “Flash” television series. It seemed too soon for the cinematic universe to be jumping into a complicated alternate-reality storyline but doing so would have the potential benefit of allowing Warner Bros. an easy way to tweak some of the characters in their cinematic universe. One other stand-alone DC film mentioned was the “Aquaman” film that appeared to involve Aquaman in a war against his brother. Reaction was positive and it seemed like it had the potential to be another film that continued to change perceptions of the DC cinematic universe. With so much news, it was odd how “Justice League” was almost a footnote of sorts in coming events. One had to assume that the film would end up doing okay financially but it was a marvel (pun intended) how the mega-crossover film had once seemed like a must-win picture that now was less of an emphasis. A lengthy trailer for “Justice League” seemed to have fans feeling more optimistic about the project that was now being finished by Joss Whedon. That said, some criticized that Cyborg seemed like a forgotten or lost character in the ensemble. A Superman figure shown in the exhibit hall seemed to reveal that Superman would return wearing a brighter costume and a lightening-up (or Marvel-izing) of the Justice League seemed to be happening. The ultimate reception for “Ready Player One” might just be serving as a test of sorts to see if my instincts need recalibration or not. A trailer was presented by Steven Spielberg and it was greeted enthusiastically by most in the hall. Concerns abounded though that the film was not accurately representing the spirit of the novel that served as its source material. So much of what was shown reminded me of shots from a “Tron: Legacy”-type world and that drab look was just not what I had imagined while reading the book. It was interesting that “Stranger Things” – amongst other properties, like “The Lego Movie” – had almost seemingly beaten “Ready Player One” to the punch by hitting on just the right buttons of geek nostalgia while providing a compelling story. Some pundits were skeptical of the lack of certain key licensed character from non-Warner Bros. or Universal/Amblin properties and that was a certain cause for concern. The big question with “Ready Player One” would seem to be if Spielberg chooses to use the film as a critique of wallowing too much in nostalgia, thus providing a valuable commentary on stagnation in creativity. That was a theme that was only very lightly hinted at in the book and a missed opportunity on author Ernest Cline’s part. He, presumably, wanted to avoid risking the geek backlash amongst wallowers that would result or he simply never thought about the work in that light (i.e. the book was his wish fulfillment story and he wanted to live in a blanket of never-ending nostalgia). “Blade Runner 2049” had been projected as a major Saturday panel but the marketing team pushed out the full theatrical trailer to the internet six days prior to the panel. Harrison Ford was seemingly in rare form on the panel and he had several zinger lines in response to questions. Again, this was a project that had much uncertainty surrounding it. The trailers released thus far showed gorgeous visuals that seemed to match up well with the material from the first film but the key would all come down to if the story mattered. The newest Star Trek program continued to bring mixed reactions from the fan base. There was certainly interest in “Star Trek Discovery” but the show continues to create debate with details coming forth like the apparent revelation of Spock having a sister who is part of the show. That change was the tip of a bigger debate iceberg, with changes to the Klingons being another case where fans worried that “Discovery” would end up ignoring the continuity of prior television series. It should also be interesting to see how the intentionally progressive touches will go down across the entire fan base, with a gay romance between core cast members being the most recent example of such plans. The biggest issue though seemed to be the need for yet another service subscription, with the CBS ‘All-Access’ Subscription being required and costing $9.99. All told, this will be an interesting experiment to monitor. DC was a winner as far as their situation was not the swirl of madness that seemed to be surrounding Marvel Comics. That said, it was hard to predict how their immediate plans would turn out. Comics legend Frank Miller looked healthy in appearances around the convention, surprising fan as an unannounced guest at a DC ‘masterclass’ where he announced his plan to team up with John Romita Jr. on “Superman: Year One.” Miller and Romita Jr. had done a good job with a retelling of the original of Daredevil for Marvel back in the mid-1990s but Miller’s handling of Superman has never been anything less than controversial. Another few dips into the past included Geoff Johns confirming that the “Watchmen” universe would have characters coming into the mainline DC universe. If that was a good idea or not seemed very unclear. Grant Morrison also dipped into the past by announcing a sequel to “Arkham Asylum” from early in his career. DC’s Vertigo imprint teased potential new “Sandman” and “The Invisibles” work but no details were given and that ambiguity left fans to simply speculate if Neil Gaiman or Grant Morrison, respectively, would be involved. Finally, the black-centric comic book line from the 1990s, Milestone, was said to be returning. The ‘floppy’ – or traditional monthly comic – has seen a waning in popularity and rumors had circulated ahead of the convention that new formats might be announced as a potential move to a new norm but nothing significant came up. Rather DC did at least mention having three age tiers going forward and using slightly different issue sizes between the tiers to differentiate them to buyers. A trailer for the film adaptation of the 2012 graphic novel “My friend Dahmer” caught my attention if only due to being so much against the norm of other preview material at the convention. The film appeared to be a high school drama of sorts with the filmmakers trying to get inside of the head of the notable serial killer by way of the recollections of a graphic novelist who knew him in high school. While a Fox panel had been announced at one point that was assumed to be a showcase for a slate of films, that panel slot was eventually reworked to simply be a focus on the “Kingsman” sequel, “Kingsman: The Golden Circle.” There was some footage shown and the usual cast banter but seemingly nothing that would have justified in an overnight line campout. Channing Tatum was quoted during the convention as confirming that the “Gambit” movie was still planned, although details beyond that confirmation were not given. Perhaps the most curious note related to Fox was word by the show runner of the Fox television show “Legion” that he was working on a movie based on the “Fantastic Four” character of Doctor Doom. My initial instinct was that such a move was simply being done by Fox to make sure that they retained their use of certain characters licensed from Marvel but a Doom solo movie might end up being intriguing if only because it would have the potential for being better than any of the Fox-produced “Fantastic Four” films. Badge resellers (and resold badge purchasers) beware: In its second year of use, the need to swipe an RFID-enabled badge upon entry and exit could make for some very uncomfortable situations. My friends and I wondered about the need to swipe out but we learned that an un-signed-out badge did not allow a person back inside without a photo identification check. Hall H rolled out a further tweak to their line policies with space ‘saving’ for friends seeming to mostly work. Anything that would reduce the number of people literally sleeping overnight outside was a positive thing although some fans seemed to be using the camping out as a questionable excuse to avoid getting a hotel room. Amid those changes though, some claimed that as many as several hundred arm bands were forged, leaving around 400 fans without Hall H access on Saturday and apparently compensated with free 2018 convention passes. He’s more popular than ever at age 94. I was not able to get into a panel in the large-ish Room 6DE that featured a spotlight on Stan due to an incredibly long line that was jammed full of Millennial-aged fans. While the popularity of affiliated partners trying to sell autographs of Stan was at a certain ridiculous saturation point, was it so bad for Stan to be making easy cash at his age? “Bone” creator Jeff Smith had a spotlight panel early in the convention schedule and he used it to again let out a trickle of news about a supposed Warner Bros-produced “Bone” film set for next summer. If that happens remains to be seen since “Bone” fans have surely learned by now to only believe in a movie when they see, at least, a trailer. In the meantime, Smith announced a new picture book for children entitled “Smiley’s Dream Book” that will come out next summer via Smith’s longtime publishing partner, Scholastic. The book already had a sequel planned. Comic book legends Jack Kirby and Will Eisner were posthumously recognized by the convention on what would have been the 100th birthdays of both influential men. Kirby art announced as supposedly on display was a disappointment, with a huge cache of the art on an iPad that was broken. Hopefully the material later appears online in some form. Kirby was also given a posthumous writing award at the Eisner Awards banquet. Jim Lee’s Wildstorm imprint, which is now owned by DC Comics was celebrated with an anniversary and a look back to the frat house-like early days in the 1990s. Panelist drew sketches that were given away to attendees, with examples including one page that went to a fan with a pizza crust on them and another fan snagging the page for eating said crust. On a related note, Marc Silvestri’s Top Cow imprint also celebrated an anniversary. Silvestri’s signature title, “Cyberforce” was announced as being rebooted for a new 25th anniversary ongoing series. Rob Liefeld’s Extreme Studios also had a retrospective panel that was moderated by Robert Kirkman. It had a dozen or so people in attendance and required two rows of chairs on the stage behind the room’s main table. The audience was light but it was a memorable panel largely due to the energy of Liefeld and quick wit of Kirkman. Robert Kirkman announced that he had been working toward an ending for “Walking Dead” but that news was immediately misinterpreted as an announcement that the series would be ending sooner than later. In reality, Kirkman simply seemed to confirm that he had in the past come up with a potential ending for the series and had since revised those plans but the timing of when he might go down that final road was not certain. I found myself in several panels that had memorable moments that I did not predict. If anything, such twists tended to be a norm for me this year. J. Michael Straczynski had recently completed his autobiography and ended up turning his panel into a series of anecdotes related to his life, many of which were quite emotional. He started by talking about his parents, first a mother who had tried twice to kill him before age five and a father who displayed all manner of horrible behavior. Straczynski ‘s father actually destroyed his childhood comic book collection, a box of comics with ‘Joe’s Comics’ written on it, that label later being the name of his creator-owned publishing imprint. Straczynski’s stories led toward him talking about being at rock-bottom in the mid-2000s with financial ruin being near before he re-invented himself as a film scriptwriter with the surprisingly quick sale of his against-type drama “The Changling.” He urged people to not allow themselves to be defined in ways creatively that could lead to being easily discarded as trends or buying needs changed. He had seen such a fate happen to many friends and risk-taking needed to happen to avoid such a fate. A lighter note during the panel involved Straczynski talking about when he swore off smoking marijuana. He had been watching “Casablanca” on television and switch from the program to something else and back at a commercial break only to see “The Maltese Falcon” playing. He reconciled that his clouded mind had thought that he was initially watching the wrong movie and ended up doing the same thing when a later commercial break revealed the film to be “The Treasure of the Sierra Madre.” Straczynski later learned that Bogart tribute marathons had been playing on several stations and he realized that if he had not been clear-headed to know as much that he should not be doing drugs. Garriott’s panel was unusual because he spent most of it talking about his experience as the first ‘space tourist.’ Back in 2008 he paid $30 million to the Russian Space program to be blasted up to the space station and he had interesting stories to share about the entire journey, including details about going to the bathroom that one audience member goaded from him. There were not a massive number of people at the panel and afterwards Garriott stuck around in the hallway outside the room. I approached him and we chatted for a little bit. After thanking him, I mentioned trying to get his game, “Ultima 7” working on my uncle’s computer and memorably learning quite a bit about computers (particularly the MS-DOS operating system) due to some technical complications that Microsoft had created for the game right before its release. Garriott ended up getting very engaged on the topic and went on explaining some of the back story. It seemed meaningful to him that that odd experience ended up being a certain foundation moment in my self-education regarding computer. The Todd McFarlane spotlight panel had Robert Kirkman on stage in a sort of ‘second banana’ role that allowed Todd to bounce off him. In the end, it was a hilarious panel with Kirkman poking witty fun at Todd’s assumptions that he was hilarious. In a moment of brutal dark humor, Kirkman took a shot at Todd by suggesting how the photos would not be funny if they were being snapped when Stan happened to take a nap that he never woke up from. At one point, Kirkman and Todd both got wound up enough that they were standing on top of chairs and Todd even got atop the panel table, high above the crowd. He was initially scolded by a nearby convention staffer who he waved off with claims that he had ‘Great insurance.’ A few moments later, a blond woman in a suit came up to the stage and said something to him that caused him to quickly back off. Fans assumed the woman to be a higher-ranked convention official and boo-ed her. Todd then informed everyone that the woman was his wife and the crowd roared so loud that the room shook. In all, Todd managed to be a good salesman for why creators should go with Image Comics, given that they can retain their rights. The major problem though being getting an audience to travel with a writer. One related note was his observation that Hollywood was desperate for super-hero properties but that Warner Bros. had the DC universe locked up while Disney had Marvel characters off the market. This left an opportunity for creations outside of the ‘Big Two’ to be shopped around. Technically the Extreme Studios panel was more than just Liefeld’s spotlight but he was the headliner and he provided much of the panel’s energy. It was poetic, given Liefeld’s publishing history that the panel started ten minutes late. Despite the room being more than half empty (and even at that, people behind me were only there for a spot in the next panel), Liefeld brought his ‘A’ game and almost rendered the normally-talkative Robert Kirkman irrelevant as moderator. Almost. Kirkman had a memorable moment in conjunction with Liefeld when a couple of young women got up to leave the panel, one holding a vinyl record that Liefeld offered to sign while shouting “It’ll be worth more!” The girls did not realize that they were being heckled until they had nearly exited the room with the vinyl record holder ending up positioning the record over her face. The panel often felt like sitting in on a family reunion as wild or funny stories were told about the early days of Image Comics. In what was a crazy panel throughout, the craziest moment of all came at the end when panelist Marat Mychaels ended up proposing to his longtime girlfriend in what was a sort of callback to Liefeld’s own proposal to his wife at the end of an issue of “Youngblood.” She accepted. I had a chance to speak with Liefeld in a booth on the exhibit floor the next day and mentioned how impressive his energy was in the panel. He seemed to be a very gracious guy who was still humbled by praise, someone who has weathered much criticism over the years by comic book fans but who will always be regarded as one of the key figured in comic book in the 1990s. The artist Bill Sienkiewicz always had a unique style that I remember disliking as a kid but growing to appreciate it as an adult. He was the focus of a panel looking back on his work on the 1980s Marvel “X-Men” spin-off “New Mutants” but aspects of Sienkiewicz’s life wove their way into the discussion. Of note, coming up a couple of times, was the assumption by many fans that Sienkiewicz’s art style reflected his being a heavy drug user. He denied that being the case, suggesting that his reputation had much more fun than he ever did. That said, he mentioned drinking heavily at times because of growing up as a farm kid in New Jersey. He once broke his hand and the experience of accidently threatening his livelihood caused him to quick smoking, drinking, and eating sugar. He became divorced around that time as well, something that came about due to his past behavior that he later changed. I attended several panels that focused on comic book creators of the 1970s and 1990s and in all cases, save for the Todd McFarlane spotlight panel, attendance was nowhere near the capacity of the rooms where the panels had been scheduled. There were many reasons why those creators could no longer draw large crowds but the conclusion that time marches on – for both creators and their fans – was inescapable. While observations were only anecdotal, there continued to appear to be fewer numbers of people in costume at the convention. A couple of years ago, it seemed like a relatively large percentage of attendees came in costume. However, a casual glance down one hallway showed no one in costume, save for a girl wearing a headband with furry ears. Yes, that lack of costume sightings was unusual but it was reflective of a general decrease in costumed attendees. Surely there will always be people willing to dress up for free in exchange for attention but that number seemed to be dwindling despite public perception to the contrary. The collectible fad of Enamel pins – which have engaging shapes and painting on them – has been rapid in growth but it was inescapable. In fact, the convention gave out pins related to Comic-Con to all attendees and many, many dealers offered them in some manner. Some panels also handed them out to attendees, such as “Watchmen”-related pins at a Geoff Johns panel for DC. The mash-up of licenses or ‘remixing’ trend in toys or other collectibles was still lurking around but perhaps not as pervasive as in the past year or two. Parties were on the decline with past sponsors like Hitfix pulling out. In recent years, NerdHQ had conducted some well-run off-site panels at Petco Park that were not affiliated with the convention but those panels were apparently difficult to coordinate and NerdHQ opted to not run them this year. This has been happening for a few years now but the movie studios continue to abandon Comic-Con. D23’s timing was bad but there was really just the Warner Bros. panel and what were basically Marvel’s leftovers from D23. Mile High Comics out of Denver caused waves by pulling out of the convention a few weeks prior to its start after 44 years of attendance. Mile High owner Chuck Rozanski brought up explanations ranging from not getting an apology from organizers over loading dock hassles last year to rent increases to a decrease in foot traffic that blamed attractions off-site from the exhibit hall. Rozanski also complained that the decline in comic book influence began with longtime attendees no longer able to reserve a spot for convention’s following year and instead having to go into an online lottery. Those complaints ignored a general continued softening in comic book sales and a growing lack of interest in back issues outside of certain key issues. Comic book sales were certainly still happening at Comic-Con but the disappearance of Rozanski’s usual giant-sized mega-booth was noticeable. Dealers proved educational in some conversations though, with a friend and I learning from one about the impressive, if problematic, nature of lead paints in printing in the past. The same dealer told us about how robots and spaceship-related items were still amongst the first things that he sold out. It was not surprising to notice how dealers continued to typically only bring items that were rare or had a decent markup on them. The convention staple of the ‘quarter box’ or even the ‘dollar box’ was not something to be found. Original art dealers continued to be a perplexing bunch with huge prices on page after page of causally-displayed binders full of art. It seemed unfathomable that they had very much in the way of sales volumes given the lackluster state of such presentations but the same dealers keep returning year after year and must be moving some level of merchandise. Years ago, zombies displaced vampires as the creature of the moment. Unfortunately, there was still nothing clearly vying to take the crown from zombies that one would call obvious. On a personal note, the lingering memories for me from this convention with be moments that reminded me to always expect the unexpected and to embrace the personal interactions with creators that the convention allows. From the standpoint of macro views of the convention, a few new trends had emerged in collectibles and an emphasis of film promotions at the conventions continued as such promotions were splintered across other emerging conventions. I have seen pundits argue that the San Diego Comic-Con is increasingly a television convention and such a point was hard to dismiss. Films continued to have some limited impacts but it was not a particularly memorable year in that regard. That said, a broader, more diverse, and more accessible convention is likely the best thing for its longevity in the end. It has proven to be a convention that adapts and changes and, despite the usual calls for the nostalgic days of it being a comics-only convention, an ability to reinvent itself is not a bad thing.